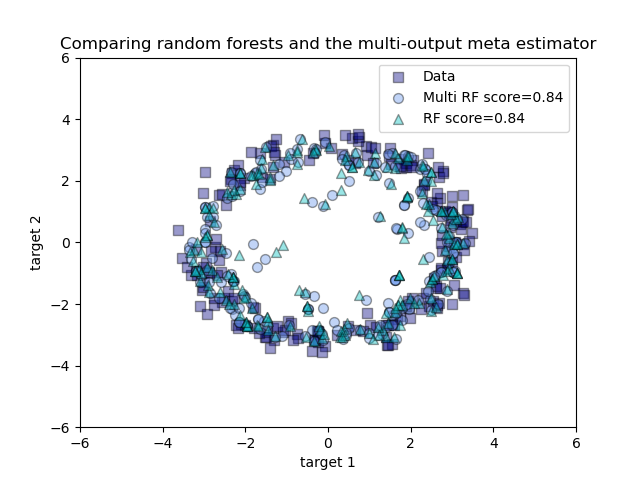 An example to compare multi-output regression with random forest and the multioutput.MultiOutputRegressor meta-estimator. This example illustrates the use of the multioutput.MultiOutputRegressor meta-estimator to perform multi-output regression. A random forest regressor is used, which supports multi-output regression natively, so the results can be compared. The random forest regressor will only ever predict values within the range of observations or closer to zero for each of the targets. As a result the predictions are biased towards the centre of the circle. Using a single underlying feature the model learns both the x and y coordinate as output.